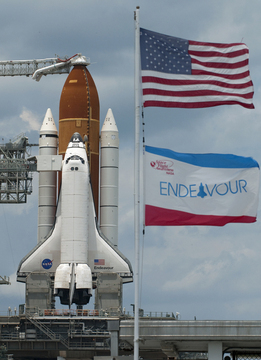 The final shuttle launch scheduled for Friday marks the end of this era in space exploration. I covered the 2nd to last launch previously. Now the last ever shuttle launch is imminent, there are lots of anecdotes and reminders. 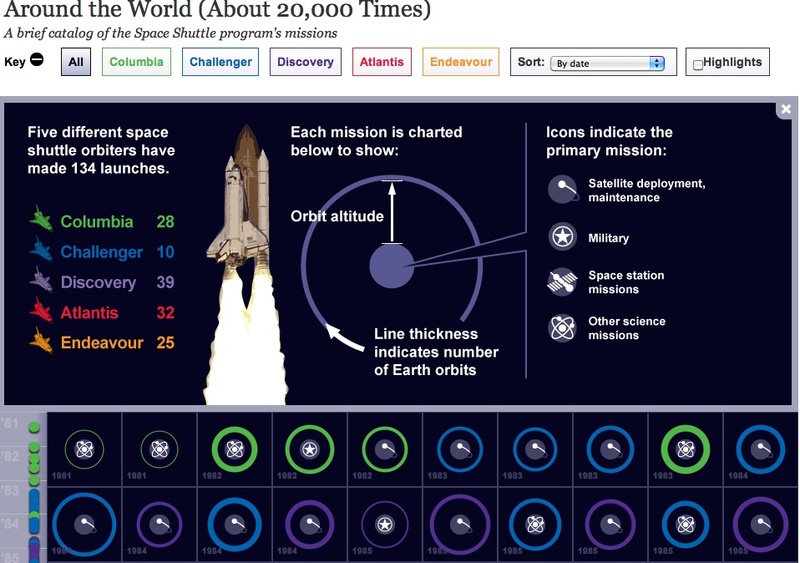 Here is an interactive graphic the details the history of this unique space program, courtesy of the Wall Street Journal. Because the final shuttle launch is not routine, it will garner lots of media coverage to mark the end of this type of space exploration. While the launch is significant, the completion of this last mission is still important. The final event is the landing and safe return of the shuttle. You can then visit it at a museum in the near future. I have seen one in person – it is not as big as I imagined it to be. Space travel is still very dangerous. The engineering challenges are huge and there is no room for error. Each system must work flawlessly; if there is a problem, there are redundant and backup systems. The shuttle changed our perception of space travel. It made it seem more pedestrian, safer than being ‘spam-in-a-can’ riding in a giant rocket. The re-usable shuttle allowed us to rationalize that this type of travel could be within our reach someday. Not yet, not soon either. I think routine commercial space travel is 1 or 2 generations ahead of us. Advances in technology will continue at a pace that is relative to the level of funding. Remember, we met the challenge from JFK to land on the moon in 10 years. We can achieve a similar milestone, all it takes is money. I’m curious to see what the next era for space travel will be. Whatever the goal is, it will increase our engineering capabilities and expand our knowledge of the cosmos. It will also provide benefits to our daily lives as the technology designed for space travel is leveraged in commercial products and services. There are only 2 missions left for the Space Shuttle. The next-to-last, oft-delayed launch is scheduled for lift-off early Monday AM. Space travel remains a complicated, high risk and high cost business. In the sixties, space exploration dominated our psyche. Growing up, every one wanted to be an astronaut along with being a cowboy and president. Not necessarily in that order, either. But, I digress. The first shuttle launch was big news. Big. After the moon landing, the space race was over. Victory was ours – mission accomplished. Met the challenge JFK set for us early in the 60s. Development of a re-usable space vehicle along with a cargo bay was radical. So was a vehicle that could land like an air plane on a runway. For the first shuttle launch, a guy in our group brought in his 19″ portable color TV so we could watch it live a work. Media coverage played up our latest space exploits – it was the event. We stopped and watched in awe as this 1st ever re-usable rocket lifted off. Restored our sense of national pride. The initial shuttle launch was soon after the Iran hostage incident at our embassy in Tehran (a topic for another day). The 1st ever shuttle landing was big new as well. We could not get enough information about the landing. Where, when and the modified 747 jumbo jet transport to bring it back to Cape Kennedy. The shuttle timeline, history and more is on NASA’s site. Over time, shuttle launches and subsequent returns were frequent and almost routine. The media gave it less and less coverage and the shuttle comings and goings became a casual event. Something noted in passing. A footnote of the national evening news. Oh, is the shuttle in space right now? When did they take off? They land tomorrow? I was not aware. About 8 years ago, I was on vacation in Orlando while a shuttle was scheduled to launch. That day, I set off with my kids to Cocoa Beach to watch the launch in person. A lot of waiting with many other people in a park near the water. We had a partially obstructed view and was so amazed to see this massive thing ignite and move straight up through the atmosphere. I still remember the shock wave coming over us from across the bay, watching the vapor trail and then it was over. Worth the wait. There were many shuttle missions. Another successfull lift off and after a week or so orbiting our planet, the shuttle landed safely. Ho hum. Then came the Challenger explosion and we all learned about the importance of O-rings. Our attention turned back to the shuttle and we were reminded that going into space is a complicated and dangerous business. We have learned much since that 1st shuttle launch. Technology has advanced in ways we could not imagine. Think of some of highlights – VCRs to YouTube with video on demand, boomboxes to walkmans to iPod nano, early PCs to laptops to tablets. And, so on. With the near end of the shuttle era, what will replace it? What new challenge will we step up to and meet? How will our lives advance? I expect there will be more ruminations along this topic leading up to the final shuttle launch. The media will play it up and underscore the significance of this event until we become numb to it and tune it out. Will you watch the end of an era live? Or, catch a replay on your smart phone on your way to a social media event?